Click on the icons to navigate through the pages. Fellowships are player communities where people of similar playstyle or interests gather to make their everyday play experience easier and more fun. You will see that being a part of a strong community will help your city to grow even more and that the path to prosperity and strength will become a lot smoother. To access the Fellowship feature, just click on it's Icon on your profile. There are no specific requirements for founding a Fellowship, other than not to be in one already. On the other hand to join a Fellowship you need to be accepted by one of the members with those rights. Fellowships are limited to 25 members. Trade without a Fee - Even if you have not discovered your fellows on the map, you will be able to trade with them without the Trader’s fee. Neighborly Help - Neighborly Help is available for all Fellowship members, meaning you can give and receive Neighborly Help to and from all your fellows, even the ones that are in far away cities. 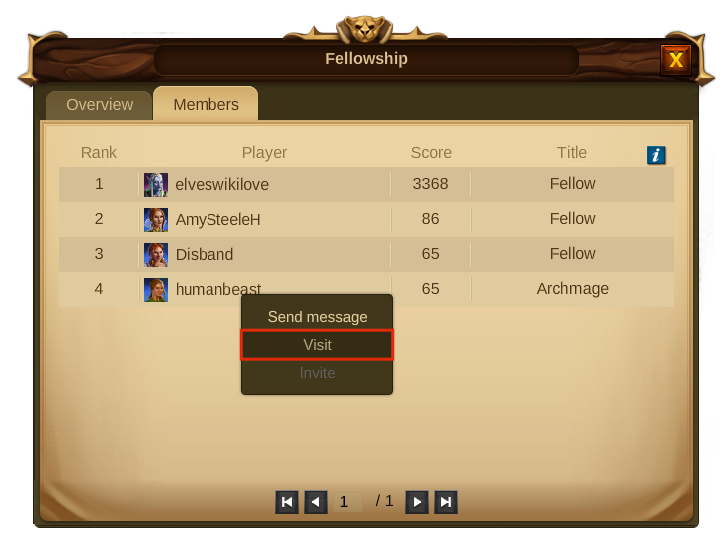 Circular Messages - All members of a Fellowship can send messages to be received by all the remaining members instantly. Fellowship Chat - By being a part of a Fellowship you can use the chat system to communicate with all your fellows, either to ask help for your city or just simply to say hello everyday. Archmage - The Archmage is the leader of a Fellowship and as such he has all the rights of the other members. Being a leader, he can’t leave the fellowship without first promoting another member to Archmage. By doing so, he automatically becomes a Mage and can then leave. On the other hand he is the only member with rights to disband the Fellowship. Mages - A Mage has most of the rights in a Fellowship. On top of regular rights, he can edit the fellowship profile and change all its options and he can change members titles or even expel them. 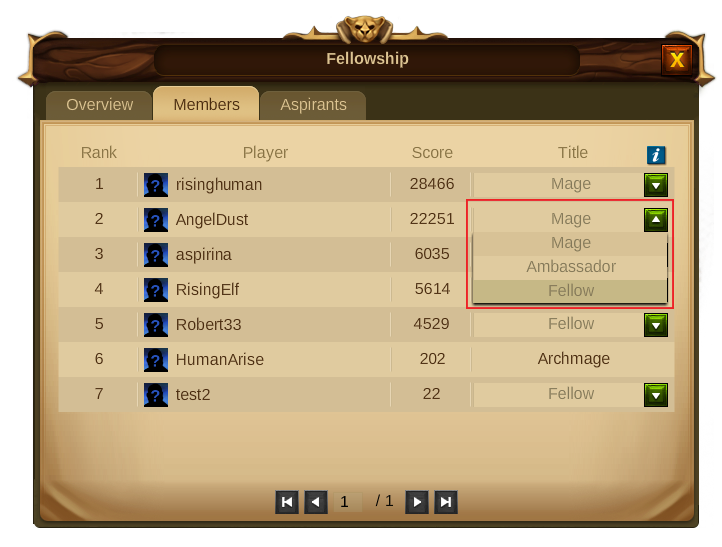 Ambassador - Ambassadors are regular Fellows that have the right to invite other players. They can also approve or reject members applications and delete previous invitations. Fellow - Every Fellowship member can use the Fellowship Chat, trade with other Fellows without a fee, give and receive Neighborly Help and send circular messages to all Fellows. 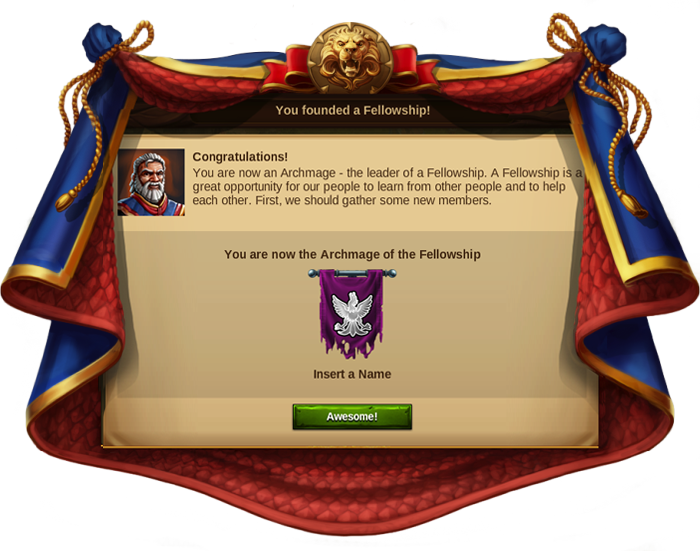 By founding a Fellowship you will became the leader of a small community of players and receive the title of Archmage. To be able to found a fellowship you need to click on the “Fellowships button” on your profile and then click on the “Found button” on the screen that will be presented to you. You will then be able to pick a name for your new Fellowship (max. 25 characters), write a description (max. 2000 characters) as well as choose and customise a banner for it. 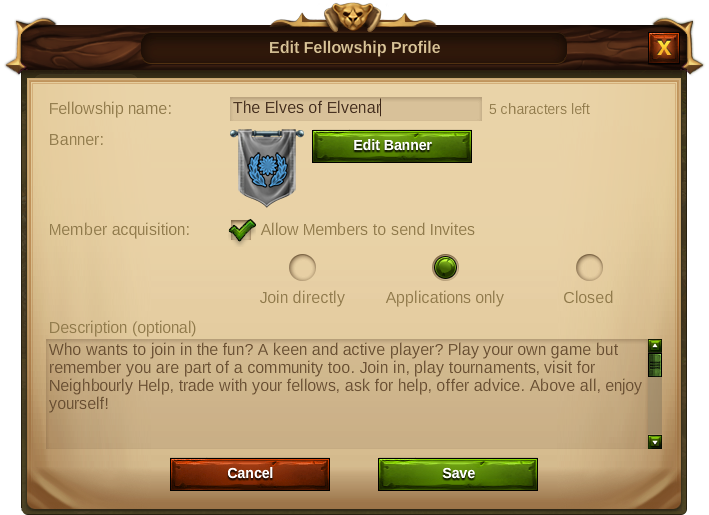 Additionally you will be able to enable or disable applications and invites - If you disable applications, players won’t be able to apply to your fellowship and new members will only be accepted by invite. 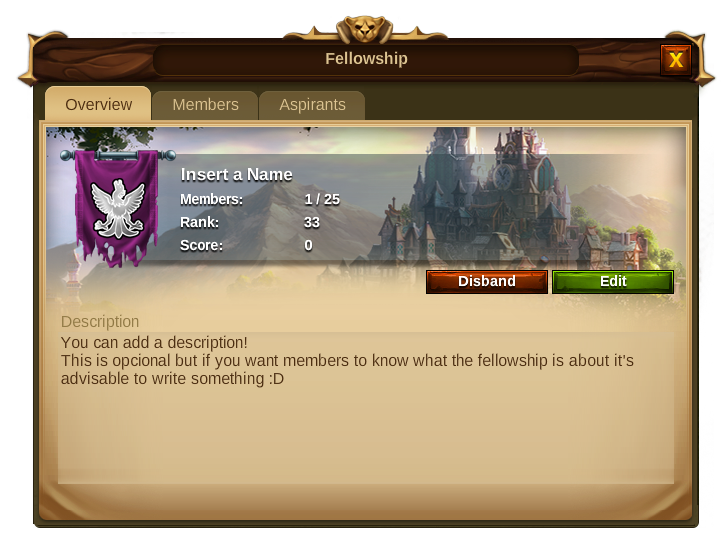 If you disable the invite function, you will only be able to add more members to your fellowship once someone applies to it. Once you found a fellowship you will be able to open your Fellowship window by clicking the Fellowship button on your profile. Overview - Here you will be able to see all the important information about your Fellowship: its name and description, how many members belong to it, Fellowship’s rank and score and it’s also the place where one can leave the Fellowship, edit it or disband it, depending on your Fellowship title. Members - This tab will allow you to see all the members belonging to the Fellowship, their rank and score and if you have enough rights, it is also the place where member titles can be changed. Aspirants - This tab will only be available for those members with certain titles and rights and it will allow you to manage all applications and invites of the Fellowship. 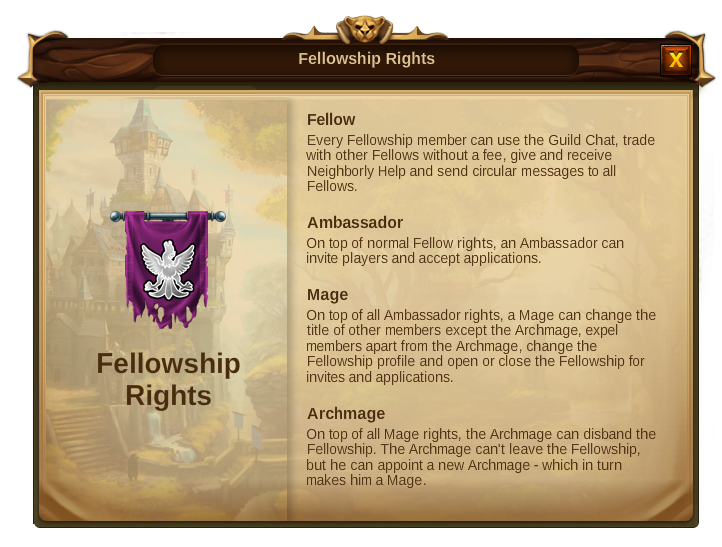 Archmages and Mages can, at any time, edit all Fellowship elements: name, banners, description, and enable or disable applications and invites. For that just click the Edit Button in the Fellowship panel, Overview tab (see above). For the banners there are numerous possible combinations of flags, colors and symbols you can choose from. 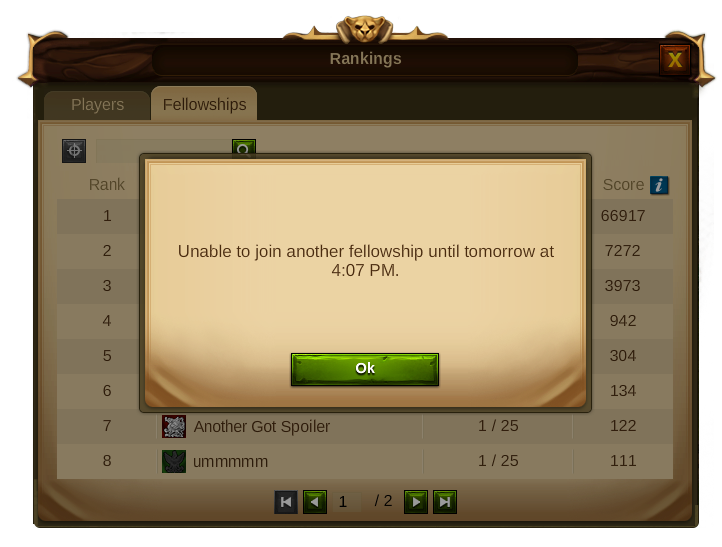 *Inviting Members - By going through the ranking's menu you can easily see which players are still without a Fellowship and invite them to yours. For that, click the player's name and select invite from the player’s context menu. 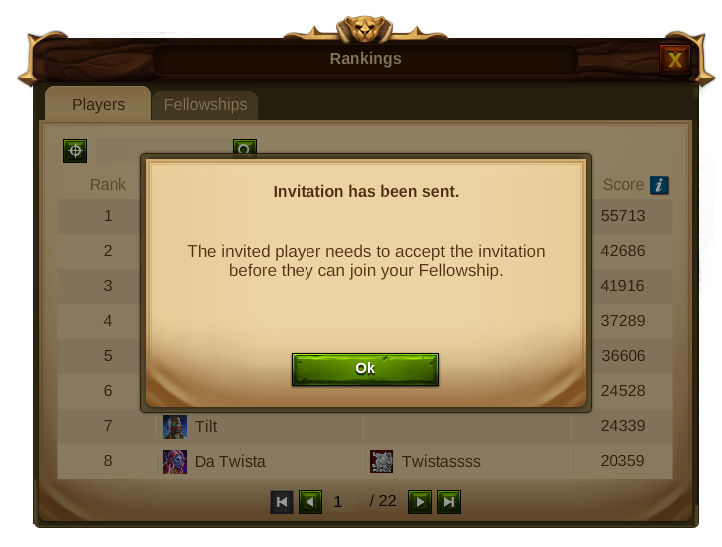 Then, the invited players need to accept the invitation before they can join your Fellowship and become members. Only the Archmage, Mages and Ambassadors can invite players. Once a player accepts the invite, he will be added to the Fellowship as a Fellow. 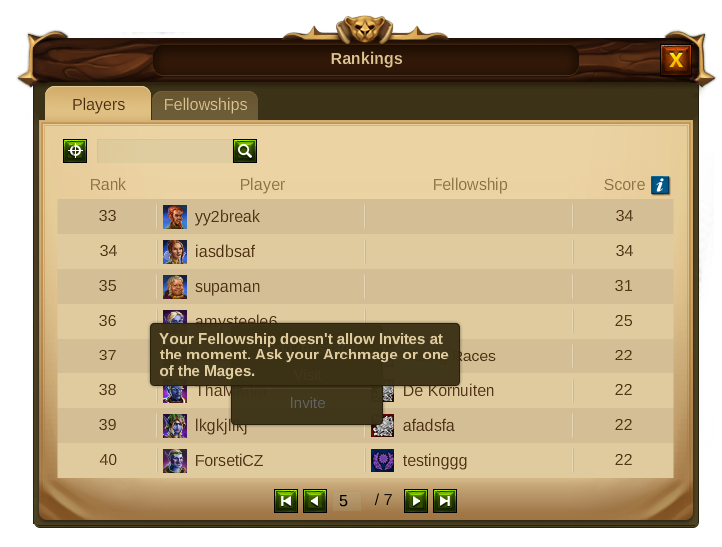 If someone else has already invited certain player to your Fellowship you will see a tooltip message saying : "This player already has been invited to your Fellowship”. Fellowships can disable the invite function in the Fellowship Profile Panel. 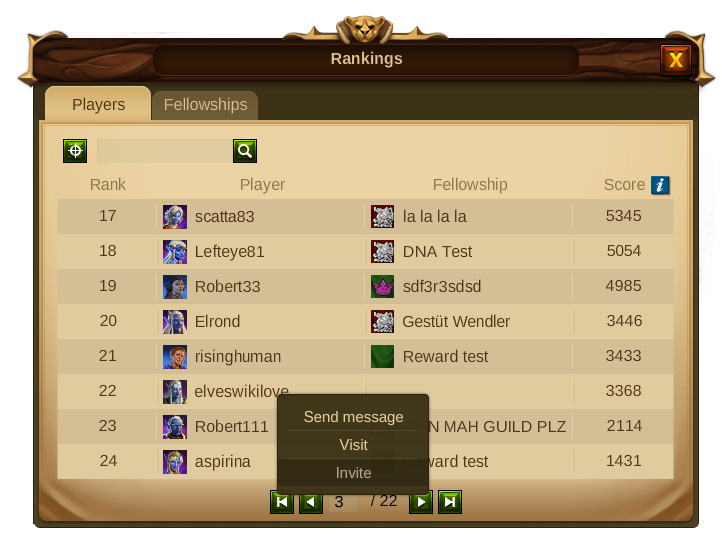 This will prevent any member from placing an invite, the invite button will turn to grey and show a tooltip message with that information when hovered. 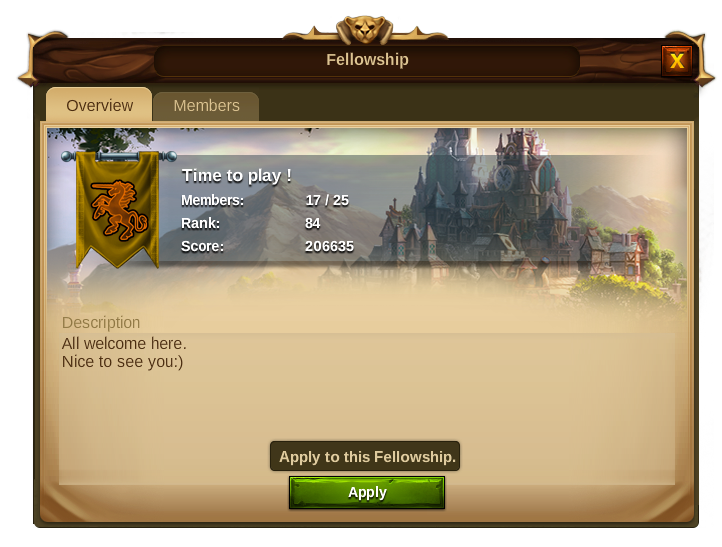 Accepting Applications - If the Fellowship didn't disable the applications function, any player can apply to it. To check the applications you have received, open the Fellowships window and choose the Aspirants tab. There you will see both your invites and players applications and you can be differentiate them by their icons, you can then either accept or reject each application in a separate way. Only Archmages, Mages and Ambassadors can see this tab, where they can accept/reject applications and revoke previous invites. 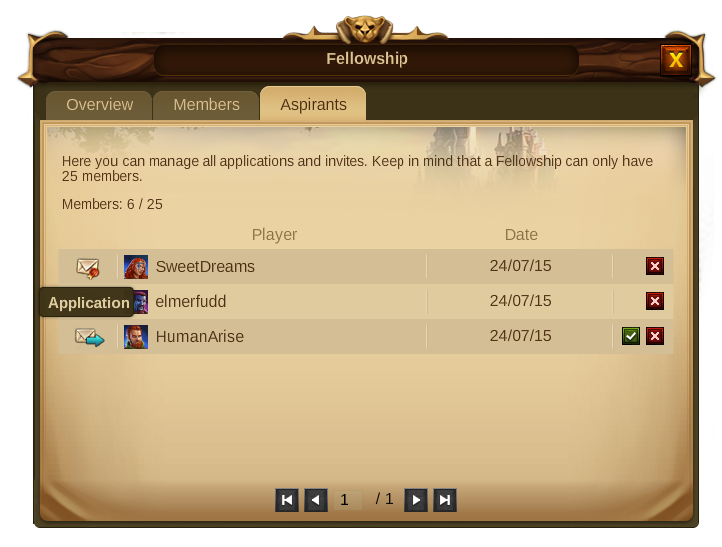 Once an application is accepted the player will become a member of the Fellowship as a Fellow. As more people join your Fellowship, it may be worth promoting some of your Fellows to certain positions.You can find the descriptions of the members titles and rights by clicking the in the Members tab of your Fellowship. 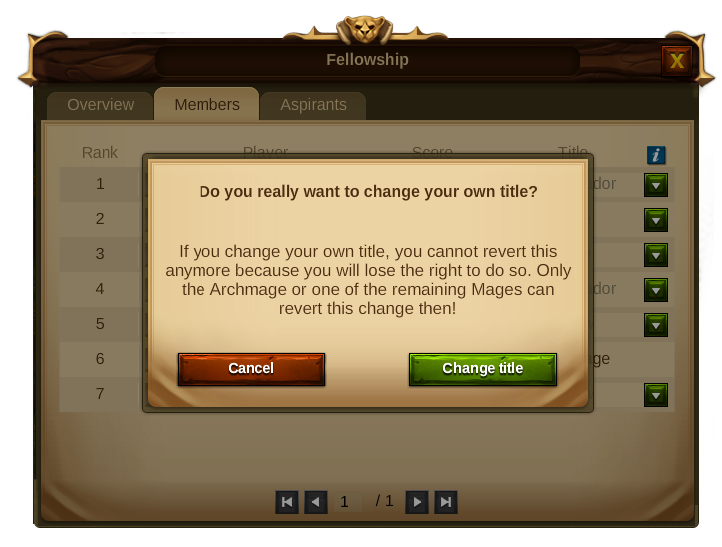 Only Archmages and Mages have the right to change members titles. 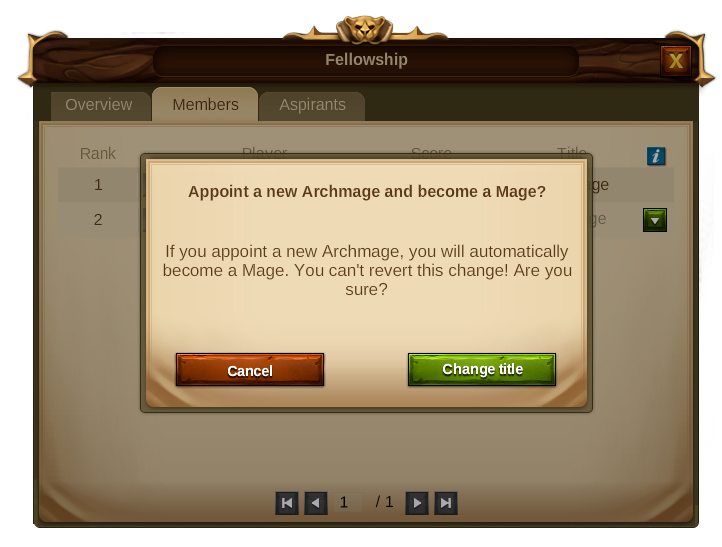 An Archmage can give his position to another player - If you appoint a new Archmage, you will automatically become a Mage. You can't revert this change and only the new Archmage can give you back that title. On the other hand if a Mage changes his own title he will lose the chance to revert the action and has to wait until the Archmage or one of the remaining Mages change it back. In both cases warning windows will show, so that you can confirm you really want to perform any of these actions. Members can only be expelled by the Archmage or one of the Mages. 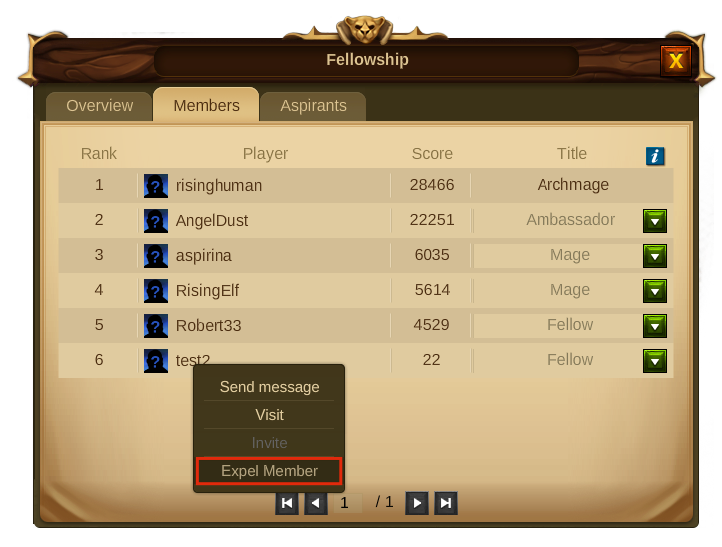 To expel a member go to the member’s tab on the Fellowship window and select “Expel”. A confirmation window will be shown to prevent you from expelling members by mistake. Only Archmages can disband a Fellowship. By doing so, all progress of the Fellowship like Ranking or Score will be lost and all members will have the opportunity to join a new Fellowship. 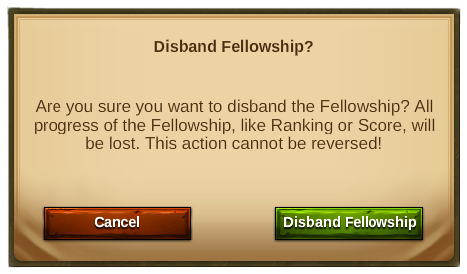 To disband a Fellowship you need to go to the "Fellowship Overview" tab and click the disband button. 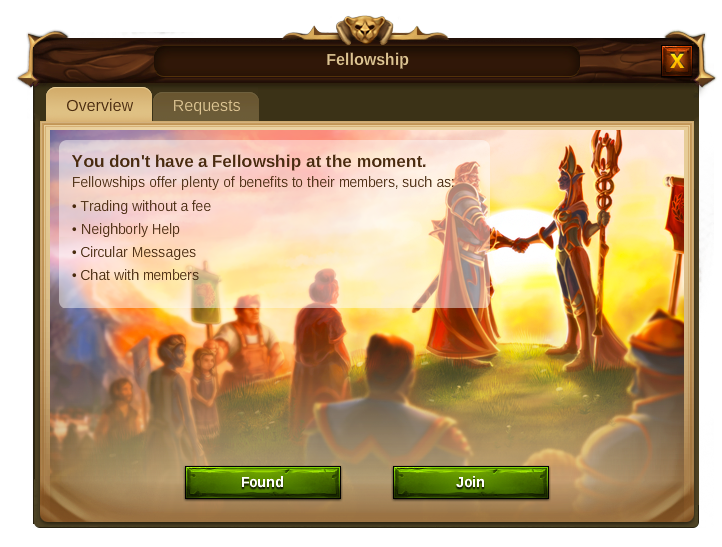 A confirmation window will be shown to prevent any Fellowship from being disbanded by mistake. If you don't want to found your own Fellowship you can just join an existing one.To see all Fellowships you just need to click the rankings button and select the Fellowships tab. To join an existing Fellowship you then need to send your application and wait until one of the members with rights accepts it. - Click the Fellowship name, select “view Fellowship” from the context menu and then press the apply button. 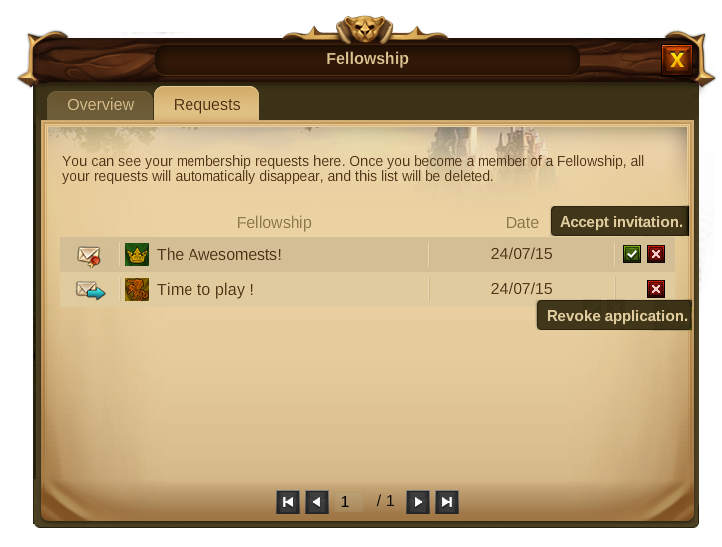 You can also see your membership requests and invites on the requests tab. 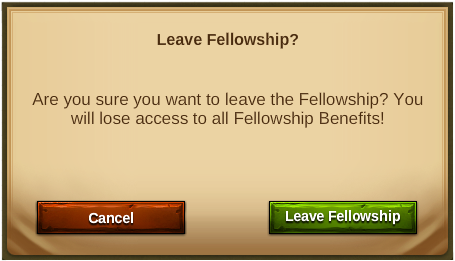 Once you become a member of a Fellowship, all your requests will automatically disappear, and that tab will be deleted. Members can leave a Fellowship at all times. For that you need to open the Overview tab in the Fellowship window and click on the “leave button”. However as soon as you leave, you will lose access to all Fellowship benefits, including the chat system! You must remember though that, as an Archmage you can't leave the Fellowship. If you really want to leave you must first promote another member to Archmage. Note: After you leave a Fellowship you can make a new one without having to wait. Being a part of a Fellowship will not only help you to grow your city faster but it will also enable you to interact more closely with other players. 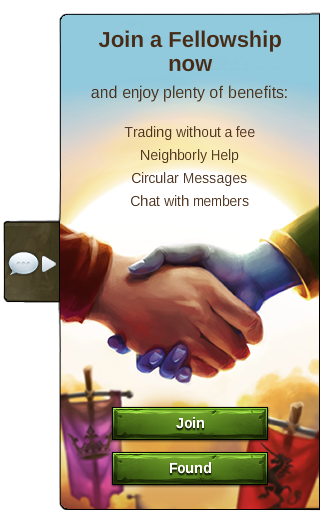 Visiting Fellows - Even if other Fellowship members aren’t located in your explored neighborhood, you can still help them with Neighborly Help, and vice versa - you can also look forward to new visitors who can support you with Coins, Culture Bonuses, and Construction Boosts. To visit your fellows, just open the Fellowship window, select the members tab and use the player's context menu to visit him. Trading with Fellows - No fees apply to trade with other members of your Fellowship, however far away their settlements are. This opens up new possibilities for trading in rare Goods – or trading with friends settled in other regions. In the Trader you can use the Fellowship filter to see only your fellows' offers. Circular Messages - It’s possible to send messages to every member within a Fellowship, letting them all know about important issues at the same time. 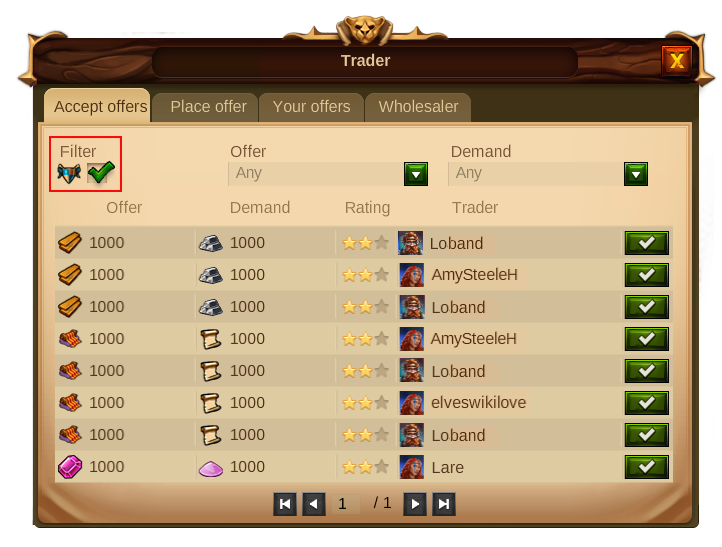 Use the feature to send urgent Goods requests, beneficial trade offers, or useful tips! To send circular messages, click on the messages button and then select the Fellowship icon so that the message is sent to all your fellows at once. Fellowship Chat - You can use the Fellowship chat to talk directly to your fellows. 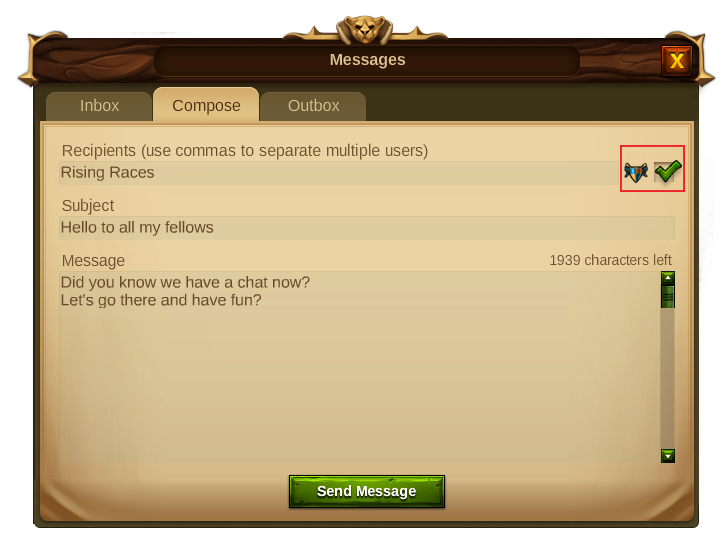 To access the chat click on the chat icon, on the right side of your screen, and it will open the chat room, where you can start having even more fun with the other players. 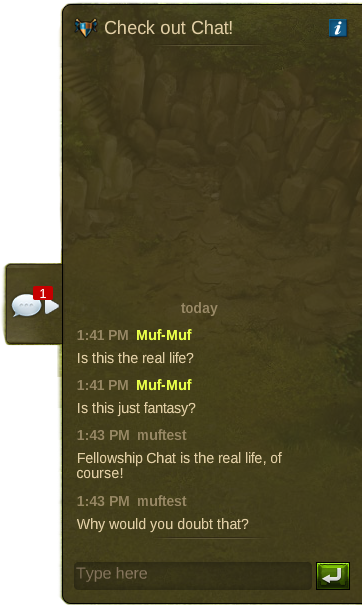 Clicking the chat icon will make the chat room visible/hidden, but even if you have the room hidden, whenever your fellows use it you will be able to see a notification showing someone wrote a text there. The chat system also records the chat history so that you don’t lose any of your Fellowship conversations when you are offline. 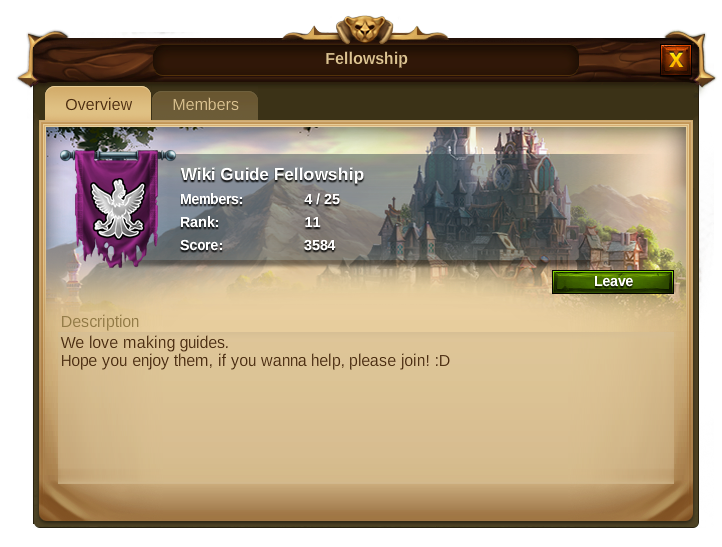 If you are not in a Fellowship, clicking the chat icon will open a panel allowing you to choose to either found a Fellowship or join one. Just like players have scores and have a position in the ranking, so do Fellowships! You can check them by going to the ranking panel and choosing the Fellowships tab. 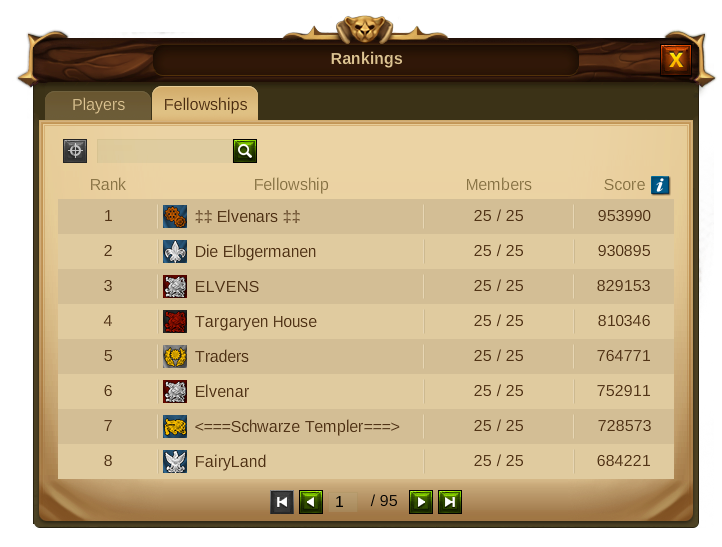 The Fellowship score is the sum of the Player scores of the Fellowship members plus the Fellowship scores gained in Fellowship Adventures. 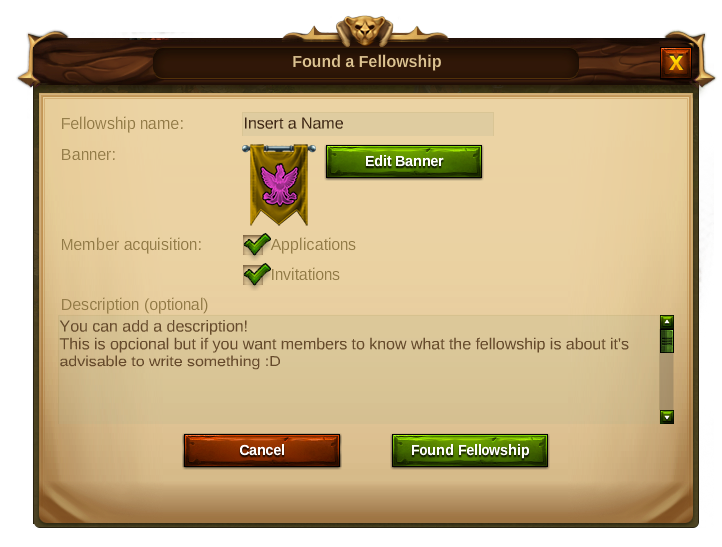 Fellowship members will become "discovered" on the World Map. This means that you will always see your fellows' cities with a green colour, just as you would if you had in fact discovered them by exploring the nearby Provinces. With Fellowships, the World Map became an even more colourful place, as you will be able to see a variety of banners with different colours and symbols. Those will also allow you to see which member belongs to each Fellowship. This page was last modified on 2 April 2018, at 07:26.